First session of the Urban Thursday Breakfasts series took place last Thursday 17 December around the topic Latin America and the Caribbean: urban challenges and sustainable development. 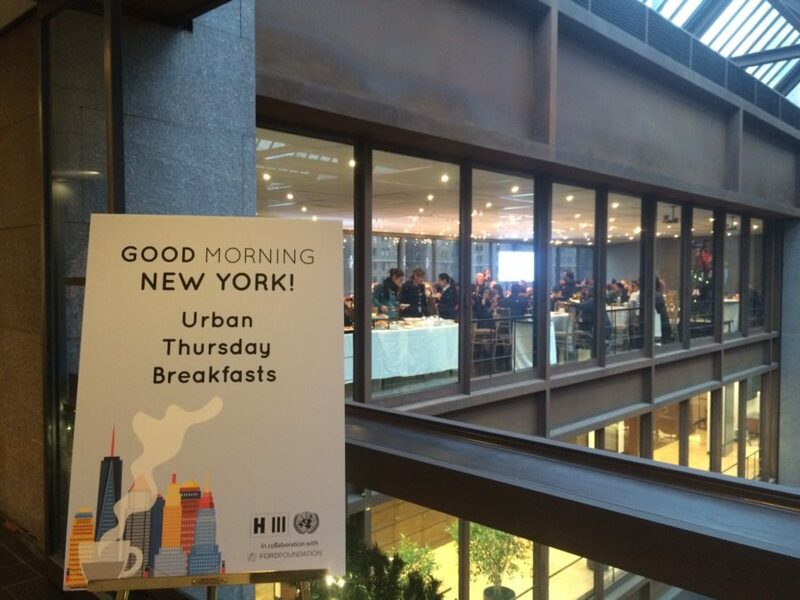 In collaboration with the Ford Foundation, every third Thursday of the month the Habitat III Secretariat organizes a breakfast in New York to reflect on challenges facing sustainable urban development and key priorities to take into account in the New Urban Agenda to be adopted at the Habitat III conference. The Breakfasts focus on introducing and discussing regional urban perspectives, with the participation of key speakers from national governments, local authorities, academia, civil society and the private sector among other stakeholders. The first panel of speakers was composed by Michael Cohen, professor of International Affairs at the New York School; Salvador De Lara Rangel, Permanent representative of Mexico to the UN; Claudia M. La Rue, First Secretary of the Permanent Mission of the Dominican Republic to the UN; and Esteban Cadena, Representative of the Mission of Ecuador at the UN. The panelists introduced the main topics of discussion allowing interaction with the audience. Mexico’s representative highlighted the excellent opportunity of Habitat III to reflect on sustainable development and put the focus on financing urban development, as a key challenge of this millennium. Dominican Republic’s representative introduced the urbanization rate in the Caribbean as one of the fastest in Latin America, and resilience as one of the main challenges of the region. Culture, economic and social policies were also discussed during the session. Next Urban Thursday Breakfast will take place on Thursday 21 January on Asia-Pacific: urban challenges and sustainable development. Videos of the sessions will be available on the Habitat III You Tube channel.